Francine Stock explores how artists responded to the outbreak of war on either side of the conflict and hears how the publishing world fed the appetite for women's popular fiction. At the beginning of the twentieth century, young artists in so many countries were finding their own revolutionary way forward. France had the cubism movement, in Germany the expressionists were in vogue, in Britain the vorticists were finding a voice. It was an exciting time for painters and sculptors. 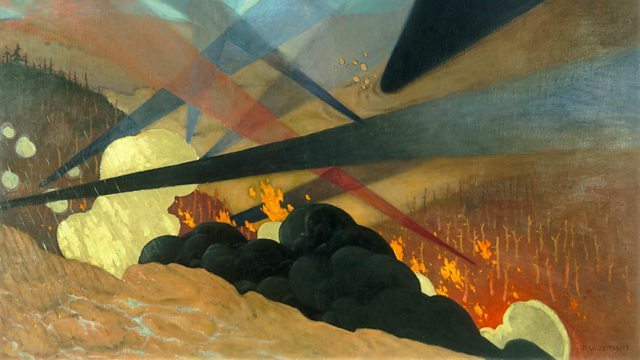 The outbreak of World War 1 fractured the international artistic community with many of the artists enlisting to fight. In the third programme of the series, Francine Stock explores what was happening in the international artistic community in the run up to World War 1, and how the commencement of hostilities affected artists either side of the conflict. In some cases, it led painters to create some of their most powerful and arresting work. Francine also hears how the publishing world responded to the outbreak of war. The magazine industry was quick to turn copy around and fashion tips included how to dress appropriately to raise morale. The book industry, whilst threatened with a lack of staff and supplies, filled the need for entertaining popular fiction. There was a fine trade in sending books to the front, and back home, women's popular fiction was awash with khaki and kisses tales of women falling in love with soldiers. As the first fighting men returned invalided and disabled, there's also a rise in the 'heroic veteran' tale where a missing limb or scarred face is no barrier to virility and love.